Apple has launched a new iPhone XS and iPhone XS Max "experience" micro-site that puts its ".apple" top-level domain to use, as discovered on Reddit. As noted by 9to5Mac's Benjamin Mayo, the address of the micro-site is simply experience.apple/iPhone, with Apple using its .apple top-level domain instead of .com. Apple acquired ownership of .apple in 2015, according to the Internet Assigned Numbers Authority, but has rarely used it. 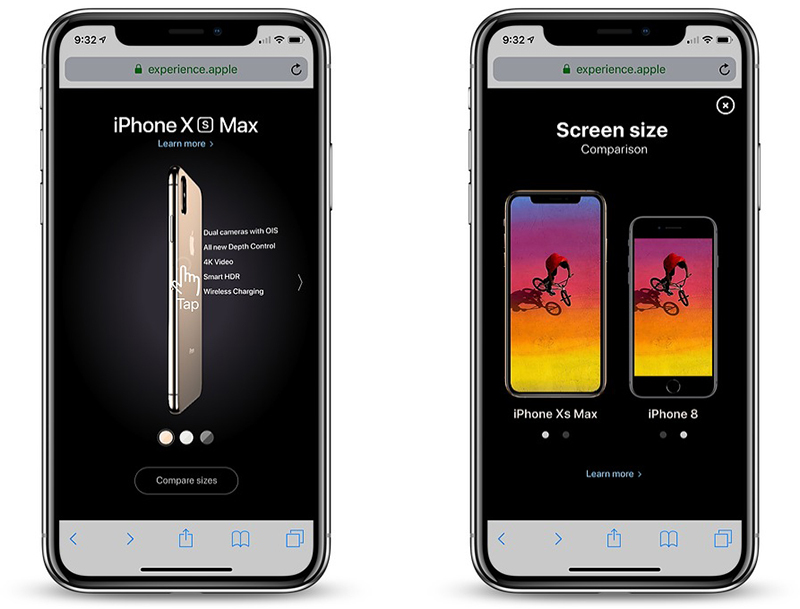 The micro-site itself is basic, with 3D renders of the iPhone XS and iPhone XS Max that rotate as you tilt your actual iPhone. The page also allows customers to compare top-level features, screen sizes, and Space Gray, Gold, and Silver finishes. "Learn more" links lead back to Apple.com when tapped. Apple is promoting the micro-site as part of its marketing campaign for the iPhone XS and iPhone XS across social media. To check it out, tap on this link from Safari or Chrome on a mobile device. Yea, because hotspot3D ('https://www.hotspot3d.com') was getting so much traffic. Wow that website is spiffy. I don't know why you'd want a corporate identity as your TLD, but no. Just for the fun of registering "pine". Unnecessary. The renders aren't that realistic and it's the same graphics from the main website.